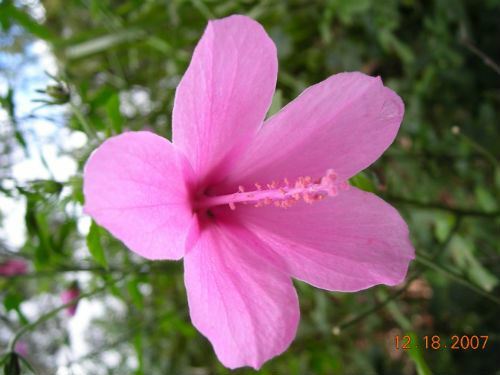 Hibiscus is a widespread genus of the family Malvaceae, consisting of 250 species, growing in regions ranging from tropical to temperate. Of these species, 35 are native to Australia and are largely restricted to the east coast. Hibiscus geranioides is a fairly recent addition to my garden, in the northern Sydney suburb of Westleigh. They are about 80 cm high and not quite as wide. As they grow naturally in the sub tropical areas north of Broome WA and around the coast to Queensland, they respond very well to summer rainfall. With the regular dry summers Sydney has experienced they flowered well, but I did not appreciate how well they could flower until we had heavy rains in several years making conditions more tropical and similar to their natural location. They need plenty of sun to open up the flower and to look their best. They do self seed, but not enough to be a problem. In my garden, they produce just enough seedlings for me to pot up and give away to friends. They really are a decorative plant and well worth growing in your garden.